Dual durometer profiles for specific applications where generic gaskets may not work. 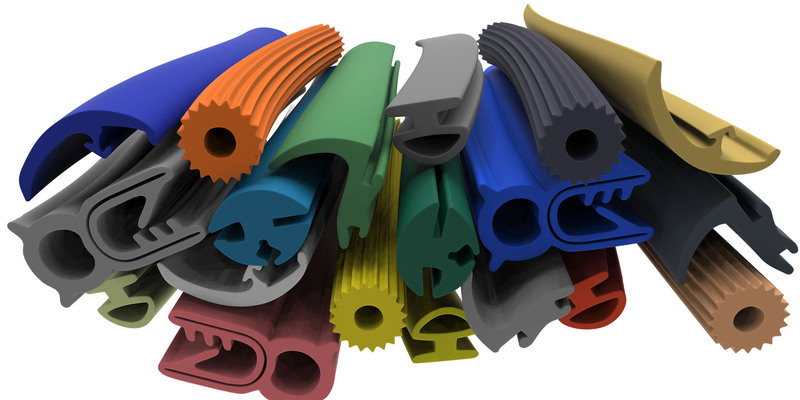 Applications where these innovative compounds and profiles include but are not limited to: Where two separate colors are required in the same extrusion. • Where a soft sealing surface is required, as well as, a hard mechanical engagement. • Where a higher cost polymer is required on one surface but a lower cost polymer is sufficient on another surface. • Where ease of installation and low shrinkage is not only necessary but critical. Dual durometer profiles may be wrapped with conductive tape to provide extra stability for EMI/RFI shielded enclosures. The base of the profile provides a solid mounting platform for the sponge sealing segment allowing low closure effort. These extrusions exhibit mechanically attached flange seals for doors, windows, panels or any other aperture requiring open-close type movements for long life. These seals function well in many of the transportation, architectural, appliance, electrical and industrial markets. Pressure sensitive adhesive and heat activated tape.